A 1978 Japanese anime production written by Takashi Yanese, Ringing Bell contains one of the most jolting shifts ever made in an animated film – taking a ruthless digression from cuddliness to carnivorous feasting in a matter of minutes. The fuzzy opening shows Chirin the lamb bouncing around green grassland with his mother, bleating away in a cute squeaky voice that sounds like a polite sneeze. Stuffed with soft sound-effects and simple dialogue, the target audience of children is never in doubt. But the movie takes an unapologetically monstrous turn as a demonic wolf tears into the barn where sheep are sleeping. Spotting Chirin, the wolf attempts to pounce – only for the little lamb’s mother to throw herself on top of her son. Moments later, Chirin emerges from underneath his mother, becoming consumed by panic when he realises her fate. Ringing Bell’s atmosphere suddenly turns black as Chirin hopelessly begs for his mother to wake up; yet the film remains aesthetically cocooned in its fuzzy exterior. Watching it is like getting a big warm hug from someone wrapped in barbed wire. Vowing revenge against the wolf that killed his mother, Chirin ventures into the woods and confronts the evil predator. 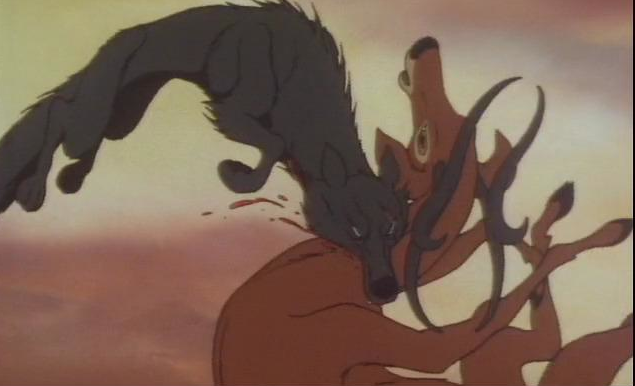 Instead of killing Chirin there and then, the wolf trains the lamb up to become a fearless beast. As he grows, Chirin eventually comes to resemble the film itself – a wolf in sheep’s clothing. Stunningly violent for a children’s movie, Ringing Bell is quite unlike any animated film before it, completely remorseless in its misleading appearance. Never judge a book by its cover. Yeong Sang-ho’s South Korean drama never pretends to be anything other than a desolate tale of enormously disturbing proportions. Opening with two lavishly-drawn broken homes, some of the first rich imagery on display is one man sobbing in the shower whilst his wife lies dead on the kitchen table, and in another home a flailing author suspects his partner of having an affair and beats her to the ground. 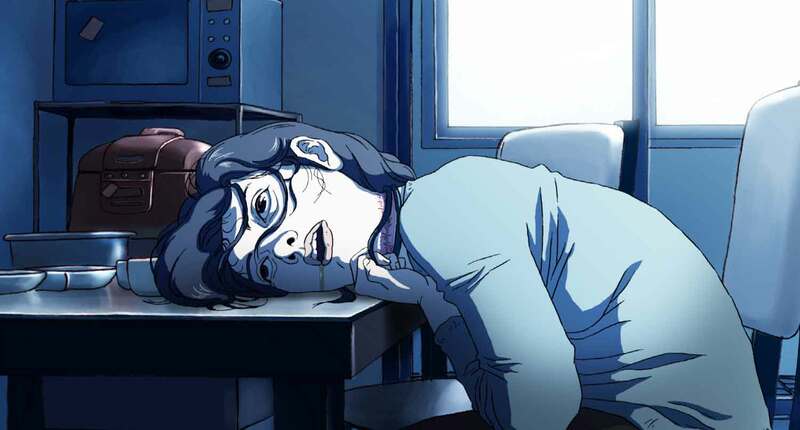 Brought alive by jarring animation that’s slickly drawn yet mechanically stiff simultaneously, The King of Pigs tracks two former middle-school friends Kyung-Min and Jong-Suk, who rendezvous following fifteen years of absence when each of their own lives appear to have fallen apart. Upon reuniting, Kyung-Min and Jong-Suk reminisce about their days at school, with stretched-out flashbacks revealing the tough ordeals they were forced to go through. Their low social ranking ensured they were given the label of ‘Pigs’ – under constant repression from the higher-ranking ‘Dogs’. The King of Pigs is an angry, extravagant drama with an ugly, depressing core. Whilst inescapably impactful in more ways than one, the film’s dark and disturbing content means that the more timid viewer will walk away during the credits as a shell of their former selves. Just mentioning the title of Richard Adams’s novel is enough to send shivers down the spine of some. Martin Rosen’s ambitious transition of the award-winning book to feature-film is often banded about as a kids’ classic – yet many children who saw Watership Down on its original run are haunted by it to this day. Despite being an animated British classic by all accounts, the film inexplicably carries a “U” certificate citing that it is suitable for all audiences – ultimately managing to scar children for decades. The film’s imagery bring Adams’ prose to life in both beautiful and brutal fashion – interspersing slow-pans over beautiful grass plains with intense close-ups of bloody violence. Rosen tells the tale of a select group of rabbits who leave their warren when a particularly fidgety buck named Fiver becomes panic-stricken after experiencing a vision of horror on their homeland. 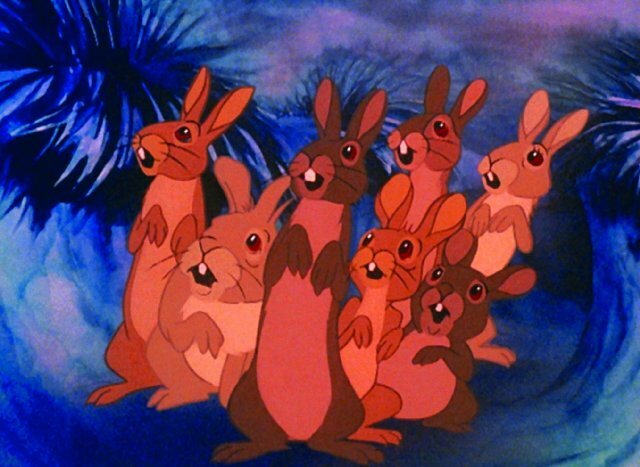 The rabbits bound out into the wilderness and come across a wide variety of terrifying predators; eventually stumbling across another warren where General Woundwort – a snarling bucktoothed rabbit who runs an intimidatingly tight ship – regards them as trouble to be dealt with. It may appear dated in amongst today’s animation, but Watership Down’s ferocity has been matched by very few since it leapt onto the big screen almost forty years ago. Based on Raymond Briggs’ 1982 British graphic novel, When the Wind Blows depicts the simplistic life of old married couple named Mr and Mrs Bloggs from rural England. A typical morning sees Mr Bloggs fetch the paper to discover that the country lies on the brink of nuclear conflict. Given their experience of the Second World War, the couple remain undeterred by the news, pottering through each day as if it were any other. They become almost nostalgic about WWII; reminiscing about the old war leaders and snuggling up together in bomb shelters. Their behaviour is adorably naïve to begin with, but tragically ignorant by the finish. Gathering outdated government war-prep leaflets from the local town, Mr Bloggs goes about setting up a makeshift bomb shelter that holds off the initial nuclear blast, and the remainder of the film portrays a retired couple’s attempts to survive in the aftermath. The innocence of the pair is achingly sad. They dismiss symptoms of radiation poisoning as being a little under the weather due to stress, and ponder why the milk or newspaper hasn’t shown up for a few days. The world quietly decays around them, with the necessities for survival slipping away one by one. The taps stops running. The plants turns “a funny colour”. The air becomes suffocating. There is an unsettling aura to the film in its careful pacing. Simple things like optimism and rationality gradually become obsolete and meaningless. The couple soon begin to run out of positive answers. All they want is a nice cup of tea. 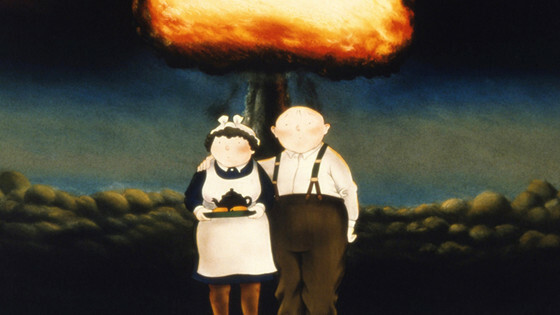 When the Wind Blows is unconventional in its animated style, and who it chooses to focus on in terms of characters; but it remains one of the most quietly powerful anti-war films in British cinema history. Perhaps the most powerful anti-war film of all time, Isao Takahata’s Grave of the Fireflies is a harrowing yet beautiful animation depicting two young children struggling to survive as WWII rages on around them. Born out of Studio Ghibli – the Japanese animation powerhouse – Takahata’s cartoon is exquisitely scripted, drawn, and scored. Using the bright bold eyes of its characters to evoke vast amounts of emotion, the film surpasses simplistic messages about love and survival – moving into new realms of study about human spirit and values. From the off, the viewer is immediately thrown deep into wartime Japan, with teenage boy Seita and his young sister Setsuko scrambling for the bomb shelters as the Allies strike upon their hometown. Seita soon discovers his mother has suffered horrendous injuries during the raid, and she dies shortly afterwards. Devastated, but determined to look after his young sibling, Seita decides to head to a distant relative’s for shelter. The pair are exposed to the disgustingly harsh realities of the aftermath of war, where every man appears to fend for himself and no other. Perhaps the most disturbing aspect of Grave of the Fireflies is how it is based on the semi-autobiographical book by Akiyuki Nosaka. It is blisteringly sad seeing Seito not only care for his sister, but also in his fruitless attempts to preserve her vivacious demeanor and rosy cheeks whilst the surrounding world abandons them. Takahata’s film proves that placing typical war iconography of battlefields and trenches off-screen does not remove war itself. War is so much more than soldiers on the frontline – extending into the homelands to mercilessly chew up the nation. 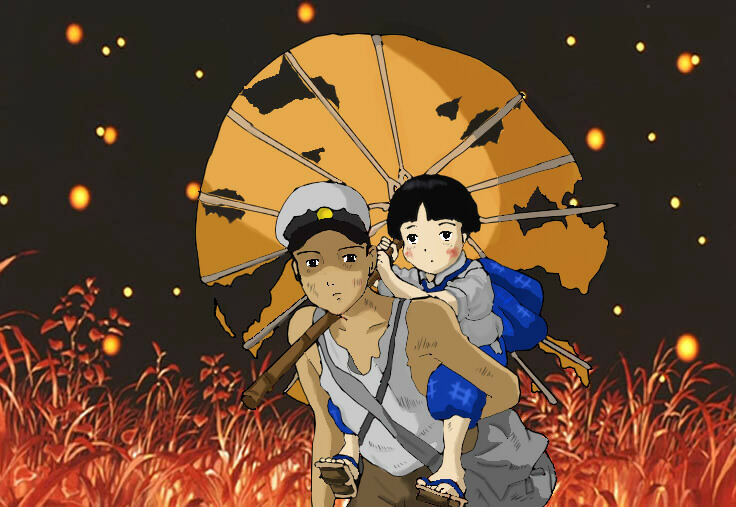 Hauntingly serene and sickeningly honest, Grave of the Fireflies is the best film you’ll never want to see again. Author Bio: Gareth Lloyd is a freelance writer with a Bachelor of Arts degree from the University of Manchester in English Language & Screen Studies, and a pending Master of Arts degree from Aberystwyth University in Film Studies. Along with postgraduate study, he writes articles on film, sport, music, social life and literature.